A sad reality is that often the most influential changes are born from tragedies. The Process Safety Management (PSM) Standard was established by the Occupational Safety and Health Administration (OSHA) in 1992 after a series of horrific industrial accidents, such as the deadly methyl isocyanate release at a Union Carbide pesticide plant in Bhopal, India, in 1984, which killed thousands. This 14-element safety standard includes specific requirements for managing risks associated with processes that utilize Highly Hazardous Chemicals (HHCs). Veolia Environmental Services, Technical Solutions (Veolia) has six facilities around the United States that are subject to the standard. In 2009, PSM was already a focal point of Veolia's safety programs, but it took on greater importance following a ruinous incident at its reclaim facility in West Carrollton, Ohio. 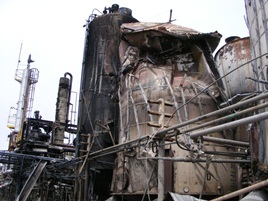 Highly flammable vapors were released from a waste recycling process and found an ignition source. Multiple explosions and subsequent fires significantly damaged many of the structures on the site. Two workers were seriously injured; luckily, no one was killed in the incident. However, this occurrence demonstrated enhancements were needed to Veolia's PSM program. In my role as Corporate Process Engineer, I worked with the PSM coordinators from the six Veolia sites to form a Process Safety Improvement Team that worked together over a period of two years to review Veolia's corporate PSM policies and site-level procedures. Additional policies were created and existing ones made more robust. The West Carrollton facility was rebuilt on a larger parcel of land to further separate the hazardous processes from one another according to an improved facility siting layout. New distillation and control technology were included in the redesign. Numerous Process Hazard Analyses (PHAs) were conducted to review and alleviate hazards introduced by the reconfigured systems. West Carrollton's workforce was retrained on PSM and refocused on the requirements of the enhanced PSM program. During the PSM renaissance, Veolia sought other ways to leverage existing PSM knowledge via trade or industry organizations. Prior to this, a true safety-focused organization for the hazardous waste industry did not quite exist. Seeing a need for industry cohesion, Veolia reached out to other companies that recycle waste liquids for solvent recovery to establish an organization called the Recyclers Safety Council (RSC). This consortium held a special conference in 2011 to share best practices related to safety programs and compliance with the PSM standard. The two-day gathering included industry insiders, as well as a representative of the Chemical Safety Board, a federal government agency that investigates industrial accidents. RSC member companies shared their experiences regarding the 14 elements of PSM, and panel discussions were held on significant PSM-related topics. Deeming the meeting a great success, members pledged to continue meetings on PSM and general safety topics regularly. A second annual RSC conference was held in April 2012, and a third is planned for 2013. Veolia continues to be a leader in this critical industry group, which understands the unique set of challenges faced in achieving safety compliance goals while processing an ever-changing variety of hazardous materials. Veolia is encouraging other companies that also strive for process safety excellence. For example, I recently spoke at the Alliance of Hazardous Materials Professionals (AHMP) conference in Anchorage, Alaska, on "Process Safety Challenges in the Hazardous Waste Industry." My message was that we must continue to share our best practices, findings from incidents, and innovative safety solutions with others who also have to comply with the same standards, because someone will undoubtedly benefit from that message. Don't wait for the next tragedy to strike to ask, "Why didn't we do more?" Join Veolia in "paying it forward" by participating in industry trade groups, special conferences, webinars, or wherever process safety success stories (or lessons) are discussed and disseminated.